At 18, Ashton Gleckman didn’t graduate from high school and hasn’t learned to drive. Yet, he just landed a job with his composing role model. Gleckman, a composer and musician, started a job this week with Academy Award-winning composer Hans Zimmer’s Bleeding Fingers Music in Santa Monica, Calif.
Gleckman left Carmel High School after his sophomore year in May of 2017. Gleckman’s father, Ari Gleckman, said his son will start at $48,000 per year. “Not bad for a college dropout,” his father joked. Gleckman interned for Zimmer’s film scoring company, Remote Control Productions, in July 2017 in Los Angeles. Zimmer has composed for more than 150 films, including the Academy Award- winning score for “The Lion King,” “The Dark Knight” trilogy, “Gladiator” and “The Pirates of the Caribbean” series. Zimmer has won four Grammy awards and two Golden Globes. Gleckman didn’t meet Zimmer until after his internship. Gleckman drew Zimmer’s attention when he saw Gleckman’s YouTube series, “Behind the Score,” in which he examines and reconstructs film scores. 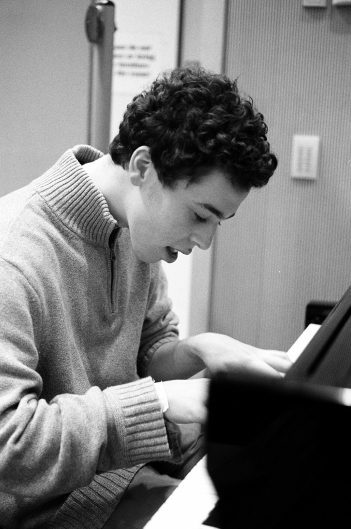 Gleckman further attracted Zimmer’s attention following the release of an episode exploring Christopher Nolan’s “Inception,” for which Zimmer wrote the score. Gleckman interviewed with Bleeding Fingers in September 2018. The fact he never graduated from high school never came up during his interview with Bleeding Fingers. Bleeding Fingers Music was co-founded by Zimmer, his business partner Steve Kofsky and Russell Emanuel. It is a joint venture with Extreme Music, part of Sony/ATV Music Publishing. Gleckman will live in an apartment less than a mile from work and can walk or bike to work. His sister, Ariana, lives in Hollywood. Gleckman attended the New York University film scoring workshop in June 2017 and spent six weeks in master classes in Vienna, Austria in the summer of 2018. Gleckman has written, directed and scored five films, including the award-winning short “The Soldier.” He earned the Best Young Filmmaker honors at the Los Angeles Film Awards in 2018.